A gathering of sci-fi crates and barrels made from Hirst Arts molds, cast in dental cement. 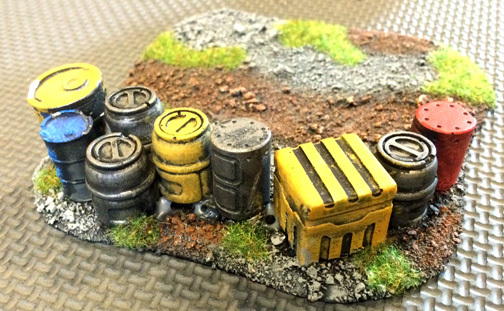 Small terrain pieces are always appreciated on a game table. 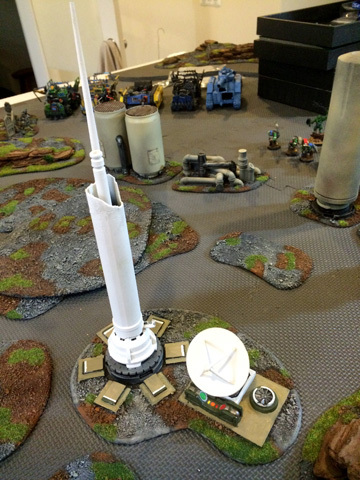 Not only can they serve as a strategically placed piece of terrain, a well-built bit of terrain adds atmosphere to the sci-fi setting of any battlefield in the Corvus Cluster. I confess, however, that I’m guilty of being overly ambitious—always planning that large, incredibly detailed ruin or refinery complex. 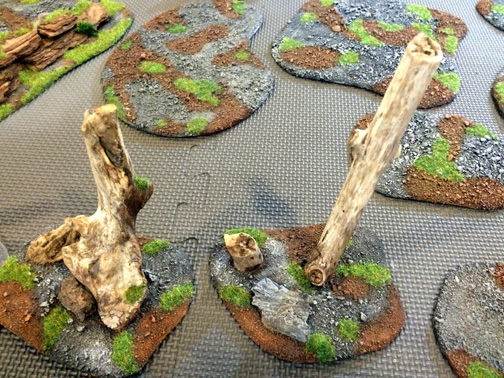 As a result, my finished terrain pieces are long and far between. I get bogged down in the details and move on to other projects. The Gaffer has taken a different tack, and I want to applaud the success of his approach. 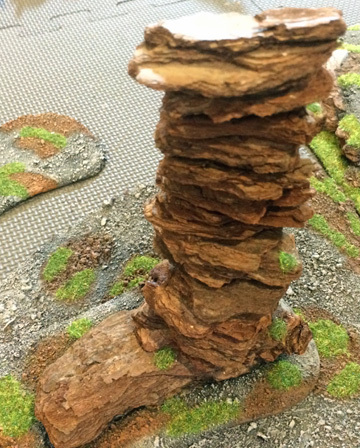 Starting from scratch, he has been slowly built a sizable collection of terrain pieces—but he began with the theory that small, easy, and quick-to-build terrain would allow him to put together the terrain pile he’d need for his tabletop. That doesn’t mean a lessening of quality–just a focus on more modest projects that produce visually pleasing and 40K-themed pieces. The following photos are a good example. All are only a few square inches in size—often averaging 6 inches by 4 inches. They can stand alone or, if the goal is a larger obstacle on the table, they can be placed adjacent to one another to create a larger industrial piece. 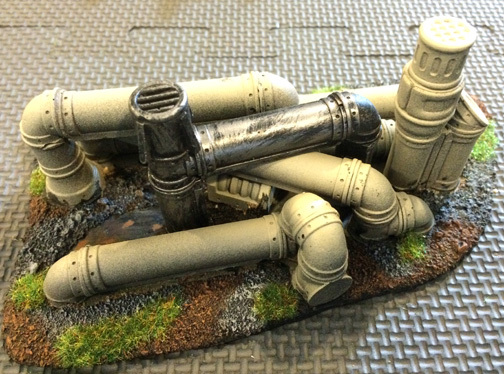 The piping assembly above is a mix of Hirst Arts blocks, cast with dental cement, and glued to MDF board with the standard gravel, sand, and flocking all wargamers use. If you look closely, you can identity these twin tanks above as soda cans, with a Hirst Arts casting of piping along the side of one. A bit of card and pin heads create the side hatch. The top grating is cut-out plastic mesh used in needlework (found at any craft store). This tower is made from a refrigerator filter. The filter’s fitting is glued to the base, so the tower can be unscrewed from the base for storage. 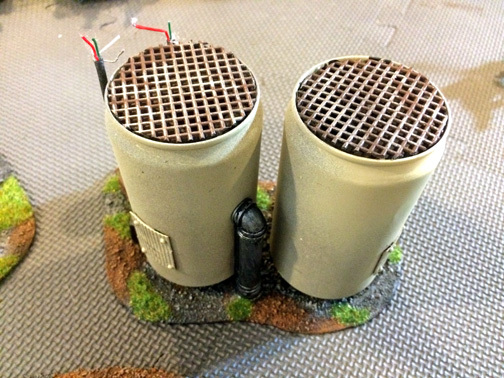 In a bid to make this a more flexible piece, the base of the tower and radar dish are magnetized, so those pieces will stay firmly on the base but can be removed and replaced with other (still to be built) alternative terrain pieces. Thus the base can serve multiple roles as an antennae array, a refinery piece, or …. who knows what the future will bring? Although there’s a bit of glare on the top of this mesa, this stone outcropping looks very nice in person. It’s simply large bark chips taken from a mulch bag and dried out, then glued atop one another. They actually work quite well in their natural color, although I intend to make some and paint them to tie into my Hegira desert world colors. The Gaffer has designed several of these mesas to fit together to create some very impressive rocky outcroppings. And that’s one of the key lessons I’ve learned from him: When you design smaller terrain pieces, consider how they can be grouped together. Cut several bases that “fit” together like a jigsaw puzzle. Then, a few refinery pieces can make a complex; a few rock formations can create a larger area of rough terrain. The other lesson I’ve learned is that, by working on terrain pieces that only take a day or two to build, you can create a sizable collection quickly. And they’ll work well on the table, whether you put down a single piece for a bit of “flavor” or you use the terrain in combination to create sizable obstacles to block movement or lines of fire. I will always be the Don Quixote of wargame scenery, spending endless hours on an overly ambitious scenery piece—and then cutting corners at the end so I can get the darned thing done. It’s just my nature. But, inspired by The Gaffer approach, I’ve promised myself that I will try to always have a small terrain project on my work table. Right now, I’ve got two: small (2″ by 2″ and “3” by 5″) refinery pieces. They’re very modest projects. But they won’t take long to complete, and it’ll just be great to get something new to add to my 40K battlefields. Maybe I’m finally starting to think “smart” (or at least “small”). Form also follows function and circumstances. 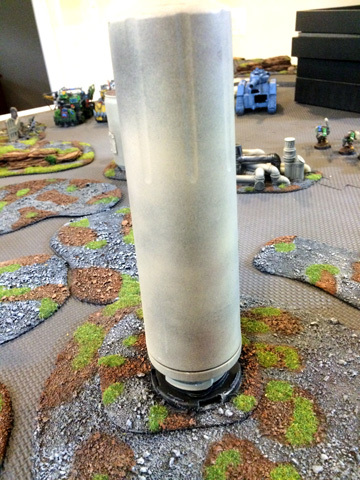 The GM has plenty of extra room for storing large pieces. I have to build my terrain with storage in mind so I start with a 12″ cube to maximize storage volume while minimizing wasted space and design the pieces to fit as efficiently as possible. The smaller pieces allow me to pack lots of pieces in a box and consequently cover an entire board with lots of terrain pulled out of about three cubes! We can mix and match the pieces for a wide variety of settings too.